Taste test: These are very good chips. They're wide-rippled, crisp, and very tasty. 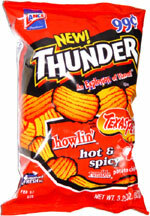 As with the other Thunder chips, there's a nice crunch, and the bag included several impressively large chips. In each bite, you get a real nice dose of a delicious hot sauce taste. 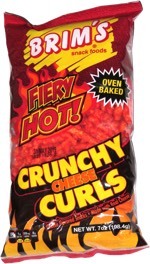 These chips are actually far less hot than some other hot chips, so if you're in it for the heat alone, these might not be your chip. Good stuff! Smell test: Very nice hot sauce smell (but only slightly hot). This snack was discovered by Jeremy at CVS Health. Review published .